Dr. Cameron B. Kepler was born in California and grew up in La Jolla on the Pacific coast. The ocean has always had a special place in his life, both in terms of recreation (snorkling, bodysurfing) and as a source of scientific interest and wonder. Cam got his Bachelor’s and Master’s degrees at the University of California-Santa Barbara, before moving to Cornell University (New York) and working with the Smithsonian Institution for his Ph.D. During the research for his Ph.D., Cam worked throughout the Pacific–in Fiji, Samoa, Tahiti, and the Line & Phoenix Islands–and became interested in the rare and endangered species of the Pacific islands. Upon receiving his Ph.D., Cam joined the U.S. Fish & Wildlife Service, Endangered Species Program. Apart from a 15 month post-doc at Oxford University in England, he spent his entire career with USFWS. 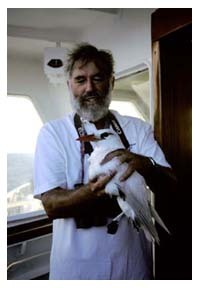 This afforded him a tremendous range of opportunities to work with rare and endangered birds. Between his work and his passion for outdoor recreational activities, Cam has travelled to all 50 states of the U.S. and nearly 100 countries. He has even made five trips to Antarctica. Cam enjoys sharing his knowledge with others, and it gives him great pleasure to know that he has ignited a spark of interest in a student, or helped someone’s understanding of the world grow.